It was around SxSW 2013 while on the road when I first fell for Web of Sunsets with their Fool's Melodies 7″. There was something in the light echoed Americana strum and refrain of, “And I tried so hard not to feel right” that assuaged our road weary heads and kept us thirsty like desert wanderers wanting more. With a full-length album coming February 18 from End of Time, the trio returns, with Sarah Nienaber of Gospel Gossip, Is/Is, Sara Bischoff from Heavy Deeds with Chris Rose also of Heavy Deeds, Robust Worlds, Sativa Flats, and Vampire Hands to make more lullabyes “to take the weight away”. Seeking to alleviate the world's pressures through their songwriting gifts, the Webs premiere their long slow dance of “Foreign Body” off the upcoming album, Room of Monsters, recorded with Neil Weir at Minneapolis's mythic Old Blackberry Way Studio. The Sunsets talked with us about recording Monsters as well as composition dynamics and logistics following today's debut. On “Foreign Body”, the trio takes their hickory smoked sentiments to the personal and physical terrains without political borders. The Web of Sunsets move as if their respective bands of Robust Worlds, Heavy Deeds, Gospel Gossip, and Is/Is were a truck driving convoy rolling along the lonely and desolate interstates across statelines. The echo from “Melodies” remains but is met by the melancholia of “ready to roll” ramblers, “living in a foreign body”, looking to drive out toward the dawn's burning horizon to shed some skin, shift some shapes, and shift places of dwelling. The journey of reverb touched guitar and electric organs exhales in the same diesel sooted breath that takes inventory of their cargo, and traveling carriage contents from, “take something from the old days”, to, “you can give me all your regrets and pack them with mine”. The internal emotional negotiations continue along the desolation road where the hometown troubles of, “take my picture off the wall”, are responded with the head strong assertions and foolish pride of, “I'll pretend not to care at all”. 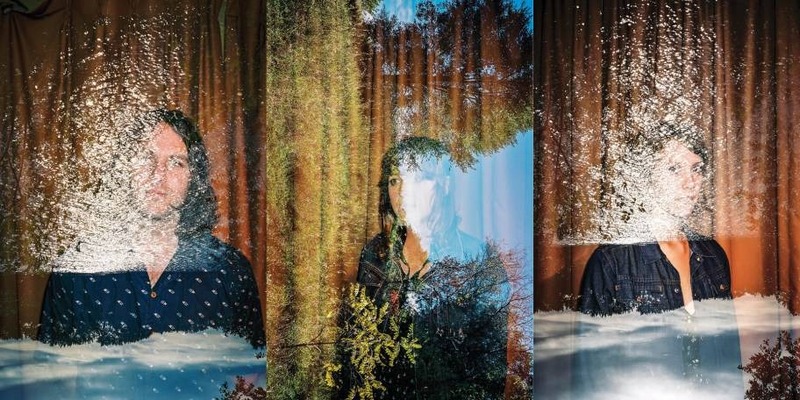 Sarah, Sara and Chris create something familiar with, “Foreign Body”, with an essence and sound that lives up to the Web of Sunsets name; where each lonesome road leaving one setting sun is met with the night fall from another one horse town. Web of Sunsets' Sarah, Sara and Chris caught up with us to give us an exclusive and intimate view into the creative way the three collaborate their expanse of songwriting duties and talents, the making of their album Room of Monsters, song constructions, inspirations, and more. What are Web of Sunsets reflections on 2013, and projections for 2014? Sarah N: I think we all feel incredibly grateful for what we’ve accomplished so far. Webs has always had this driving energy and perpetual excitement that is really extraordinary. I attribute some of that to the fact that we are all songwriters. Some of it is also just magic. We want to keep doing what we do best. We want to write as many songs as we can. Touring is something we haven’t done yet, and is definitely on the agenda. Earlier you released your excellent Fools Melodies 7″, and are about to release Room of Monsters. What has that particular process of song and creative development been like between the singles to the completion of a full-length? Sarah N: On surface level, the 7” tracks definitely are more driving and upbeat. The LP evokes a much more palpable and expansive moodiness. It’s darker, or at least it seems darker. Still, our songwriting process and general sentiment have remained pretty consistent. Before we knew that “Fools Melodies” was going to be a 7” single, it was actually tracked with a batch of songs that we eventually re-recorded for Room of Monsters, including “Sad Forest” and “Navy Blue.” We toyed with the idea of recording this full-length on our own, at home and in the practice space, but after having some time to reflect we realized we wanted the album to have the same cohesive live quality that the 7” has, which we didn’t really have the tools and ability to capture on our own. In that way I’d say that the first release really informed our decision-making when recording Room of Monsters. I like the smoky, space drifting quality of “Foreign Body”. When and what thoughts on foreign dwelling did this song first take shape? Sara B: Thank you, glad you like it. Sarah Nienaber had the phrase “foreign body” stuck in her head and I ended up writing a song around it, and was grateful for the start because it really matched where my head was at the time. The song is about leaving home and considering the consequences of that, including the possibility to go from one type of loneliness to another. But it’s also about negotiating versions of yourself, or possible reinventions that might leave you out in the cold. It’s about shifting shapes as much as it is about shifting dwellings. What is the Web of Sunsets song construction process like? Do you all huddle up with different fragments, sketches and piece them together, jigsaw style or is it more of a percolated chemistry? Chris R: So far each song has a main author. One person will bring the chords and vocals and then the other two will write parts and we will kind of arrange together. Even though this is the case, it seems to be heading towards more collaborative writing. for example The track “Room of Monsters”, that line came from Sarah N’s mind, but I took it and wrote a song off of it. Each song still has a ‘leader’, almost always the person singing but structures, tempos and general vibes of individual songs are becoming more collaborative. Having different guitars and keyboards to choose from helps push songs in unique directions. The song “Middle”, in my head initially had a more 'flowery' direction, but when Sara B settled on these deep and dark drone parts it really captured a different angle to the song and made it much better. Writing for this album was really natural, and it was really easy to play different roles in each song. Describe what your self-described 'acid folk' style means to you all. Sara B: A lot of things about our music match typical characteristics of folk or country music… song structure, instrumentation… I guess ‘acid’ was added to call out our tendency toward weirder, blurred themes in our lyrics that are less typical of the folk/country genre. That said, some of my favorite classic country songs wrap up dark messages in some sort of cheeky pun or metaphor. I like songs that are deadpan in that way, or are more nuanced in their sentimentality. Maybe there’s another made-up sub-genre for that, too? Latest from the Minneapolis scenes, and underground? Chris R: We’ve had a chance to play with some great bands, Prissy Clerks, Erros Magicos, Velveteens, Jim and the french Vanilla, check em out. We are excited for 2014 and all the new tunes that will be created. Room of Monsters will be available February 18 from End of Time.